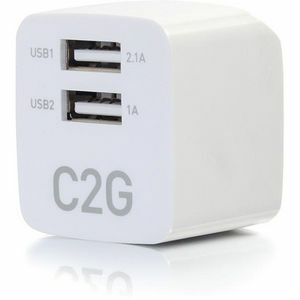 The 2-Port USB Wall Charger - AC to USB Adapter is an ideal solution for charging or powering portable devices at work, at home, or on the road. This device is designed to connect to a standard AC wall outlet and provides a total of 2.1 amps of charging power between the dual USB ports. The compact design of this adapter makes it easy to toss into a suitcase or backpack for charging on the go. The AC prongs fold into the adapter for travel, decreasing the likelihood of damage to the prongs. The power output makes this adapter the perfect solution for charging smartphones and powering portable devices.